For the days we are running on empty. For the days we just don’t think we have it in us to pick up one more load of groceries, read one more story, play one more game of Monopoly, wash one more round of sheets. For the days when we think everyone else has it altogether. For the days we’re sure anyone else would do this job better. Host this family more calmly. Have a house more presentable. For those days. For those holidays. You know the ones. I shall not wait for my house or my life to be perfect before inviting someone in. I shall remember that big hospitality has nothing to do with the size of my house. I shall not judge my house, my Holidays or my gift wrapping skills by Pinterest’s standards. I shall tell myself that no one ever did actually die of embarrassment from a small or messy space. And that missing out on community is a much worse kind of dying. I shall not compare myself to others’ traditions, decor or gifts, but find my identity in the God who came to *be* the gift to me . I shall play music loudly and teach my kids the joy of wildly off key carols. I shall remember that there’s no shame in paper plates if they’re heaped high with delight in each others’ company. I shall give my friends the gift of comparison-free friendship. I shall treat my family with the same grace I offer my guests. I shall leave the dishes and lean into the conversations. I shall not focus on fear of appearances but on fully opening my arms to my friends and family. I shall welcome my kids into the decorations, preparations, and celebrations. I shall remember that I want you here. Whether I’m perfectly ready or not. Just the way you are. Which will likely mean most days, I must open the door just the way I am too. ~ with love from one tired, happy mother to another. I love #14. Giving grace to my family. Sweet grace, sticky hand grace, and open the door after it is slammed grace. And then that grace for me. His holy grace. Thank you for the gift of these words! This list is great for the Holidays! Love it…posting it on my fridge. There is ALWAYS shame in paper plates. Can’t reuse them and can’t be recycled. Not gonna give us tired moms a pass on that one. Not the example I want to set for the way I want to leave the planet for my kids. You can disagree with Lisa-Jo about the using of the paper plates, but you should take the word shame out of your response. Shame is a killer and a bully. It’s sole purpose is to make another feel bad about their choices. There is NO shame in using paper plates if you don’t have enough “real” plates to serve everyone on. It’s ONE a FREAKING year… get off your high horse and quit judging. There are much WORSE things… like my sister telling me I couldn’t host Thanksgiving Dinner because I “wasn’t properly equipped” for it. Fortunately for ME, I’d long since declared my personal Independence from needing family approval, so I waited until after she left before I rolled on the floor laughing my A$$ off until tears streamed down my face. “Not properly equipped:! HAHAHAHAHAAAA!!!!! I’d only volunteered to host dinner that year because her husband had just died and she was feeling overwhelmed, so she was welcome to “take it back”. She “HAS” to have full china, full silver service, crystal, linens… the whole fancy-shmancy works. All *I* care about it that my family is with me, I love and am loved in return, and ….DAYUM, my family is full of good cooks, so the food is always first class! Lisa, this echoes perfectly what I’ve been feeling and writing about myself! There must be a call from the Lord for moms of littles to remember these truths right now, in this season. I especially love the part about not making comparisons. Ann’s post on that a few weeks ago has really stayed with me, and I think you’re right that it can really come into play this time of year especially. Blessings to you, and thanks for this list! This is a gift to moms, Lisa. And so are you. I especially love #12. Thank you for your wisdom and the grace you give to moms to be gracious with ourselves. 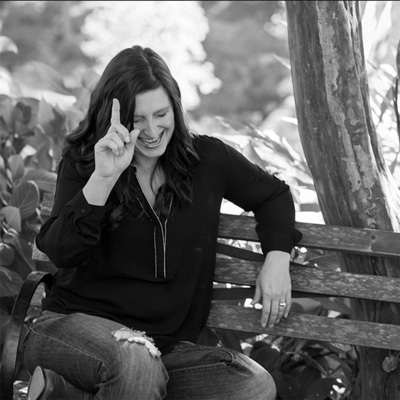 I love you so… this list is so you… so full and overflowing with encouragement, a call to be real and to be brave, and to really just LOVE above all else! 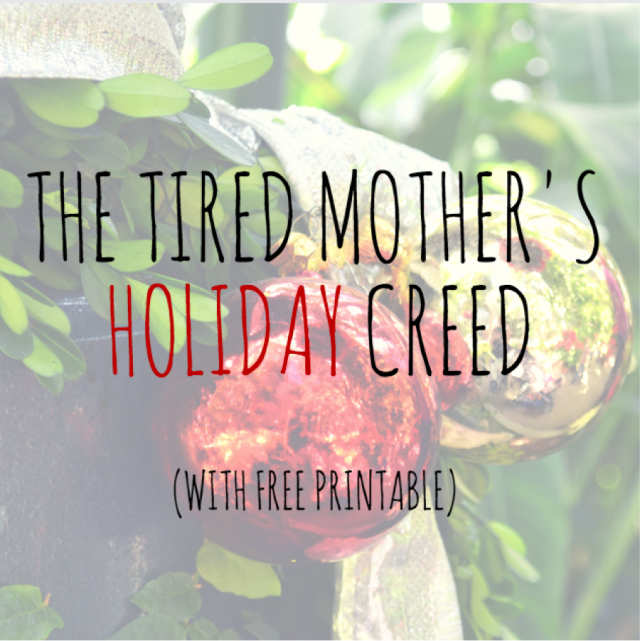 (and who among us – tired Mama or not – doesn’t need that reminder?) Praying for you! Love this! 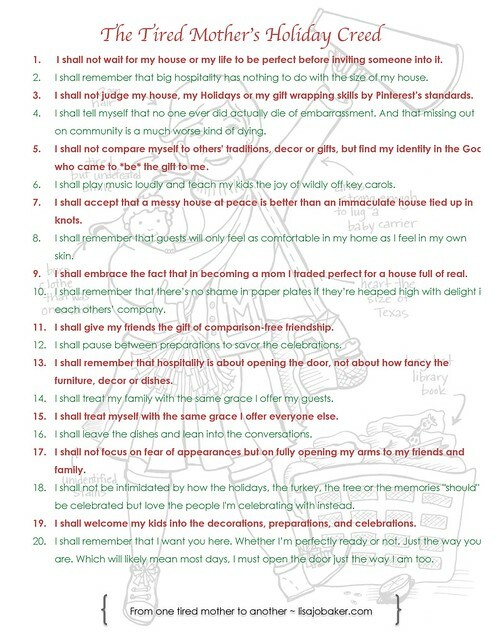 We all need to read this everyday as the holidays set in upon us. I’m a grandmother, and as a Gigi I wholeheartedly want to echo this message to every young mama I know. Quit stressing over the details, quit the comparison and enjoy your family and friends and the blessings from the Lord. I’m sharing the list with our Mom’s group…thanks you so much Lisa-Jo for putting in words what has been in my heart for years!! I think this is actually better than the original creed. Amazing. I think this one is going on my kitchen wall. Thanks for the link love, friend. I love the heart of this – hospitality and honesty and presence – as messy or beautiful (or both!) as it may be! Happy Thanksgiving, LJ! What a beautiful creed! And, there are plenty on there for this tired Grandmother to use as well. A wonderful Thanksgiving to you and yours! Once again, thank you Lisa-Jo! I have heard few of these ideas from you before, but I need to hear them again!! And the rest are also wise, people-centered, peace&happiness-focused, what-really-matters ideas. I love it. Thank you! loved the exchange on paper plates. i totally agree with the group who feel that paper plates and shame don’t belong in the same sentence. when we are talking hospitality and lessening of stress during holidays, paper plates belong in the list of our options! you go girls! it can be so difficult to learn how to remove unnecessary stress and that often includes jettisoning traditions that serve no purpose except to add stress to our lives. Thanks so much for this. My kids are grown and I still have trouble with this! I’m reposting on my blog today! Crystal, there is no shame in biodegradable paper plates. Styrofoam maybe but not paper. You can recycle them into your own flower beds. Why cannot I not download the printable version? It takes me to a flikr picture of it, and it will not allow me to print or download. Ugh. Lisa Jo, I would really like to download and print this to share with my church’s ladies at our Christmas party this next week. But this is the message I get when I click through your link…. Am I doing something wrong? Or would you possibly be able to send this to me by email?